I recently read the results of a web poll of writers who were asked to divulge their biggest fear about being a writer, and I discovered that the results were not at all surprising. Apparently artists as a whole (yes, writers included) who know their medium from the standpoints of both creator and consumer develop tastes and preferences to what they feel is "good work." The more work we observe as art consumers, the more sophisticated our tastes become, and the higher the standards to which we hold our own work are raised. No, it was no surprise then to discover that writers feared most not living up to their own standards. Having high standards is not a bad thing. What's bad is when those high standards paralyze you and prevent you from creating new work or sharing the work that you've completed. I'd venture to guess that at some point in their lives, every writer has read his or her first draft and fallen into the trap of comparing it to the finished work of a writer whose work they admire--one who unknowingly helped to form the draft writer's high standards. This kind of comparison is not only unfair to the first draft, it can also derail a project and bring it to a frustrating end. This is essentially the same thing as comparing the foundation and framing of your home while under construction to a finished home created by a favorite architect and then putting a stop to your building because the two structures differ so greatly. Crazy, right? Then why are we still letting the fear of our own standards hold us back? Because that way of thinking has become a habit and the fear has shaped our "normal" way of looking at our own work. Habits are hard to break, but it can be done if you're willing to put forth a little effort. 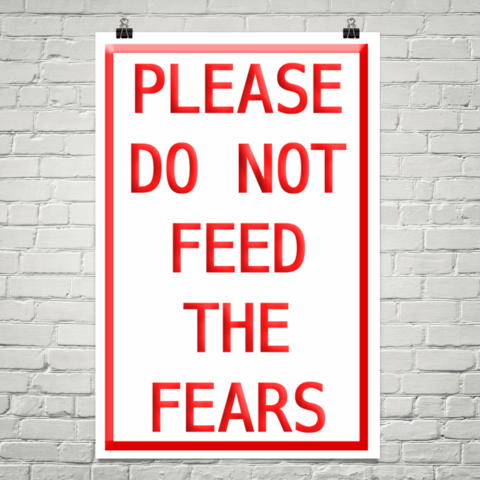 How can you break the habit of fear and learn to love your writing? 1. Practice. Write more and you'll make more mistakes--and learn how to fix them. 2. Get used to hearing your own voice on the page, feeling your own cadence and pacing, and seeing the touches that make your work yours. 3. Share your work. Your audience sees your writing very differently than you do and their feedback can be very helpful in learning to see things differently yourself. 4. Read the unpolished work of other writers. (Writing and critique groups are great places for this.) Constantly comparing your unfinished work to the edited, polished, and published work on bookstore shelves is self-sabotage. 5. Remember that you're not the only writer struggling with this. It ranked as the top fear of writers for good reason--we know what good writing is and it's what we want to create. 6. Recognize that you have high standards and know that your work can only improve if you keep working. Are you ready to feel the relief of working without the weight of fear on your shoulders? Try to make these points a regular part of your writing schedule for the next few weeks and share your results! I do write and I'm terrified all the time. True.